So…this thing happened. You may have read about it. Apparently over a million people have, which boggles my mind. 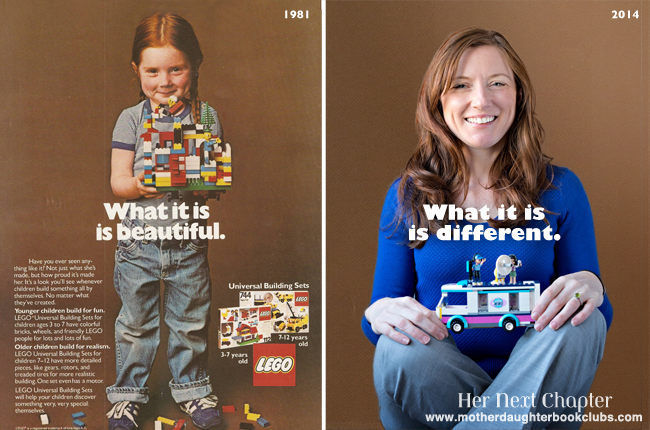 One day on Facebook, I randomly found the little girl from the iconic 1981 LEGO ad, all grown up, and in that moment of discovery, I could see this meme in my mind. I found a way to be put in touch with her. Rachel Giordano is now a 37-year-old naturopathic doctor in Seattle, and she became my co-conspirator for this article on Women You Should Know. The strength of the image, plus the PR media pitches of Jen Jones and Cynthia Hornig at WYSK, catapulted my blog post into orbit on February 11, 2014, and within the week, it had been picked up by dozens of sites around the world, from Mashable to Adweek to Yahoo! Shine. I think it is still flying around out there in cyberspace, waving at me as it passes by. What I loved about writing this piece was that it was a captivating human interest story that also got across some important points about the harmful effects of gendered toys and the dumbing down of girlhood, a topic I explore in much greater depth in Her Next Chapter. Riding the wave was fun, but holing myself up in my little home office and getting back to writing is also fun. Whee! Ya just never know!